I had great plans this week, fun things to do with the kids. Unfortunately, tendinitis in my foot, and Mr. K being sick impeded our plans. 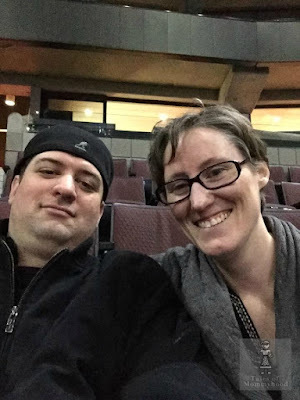 Mr. J and I managed to go to the movie theater on Wednesday afternoon, and I headed to Brinkeeto's with the boys on Thursday - followed by a trip to the DQ! Mr. J was going to his grandparents for a sleepover Friday night, but I had the whole morning to spend with them. I wanted to make it as fun as I could, and decided that we would build a fort. Our first creation was in the kitchen. I pushed the table up against the wall and lined the chairs up; grabbed a couple blankets and covered up and voila - makeshift fort! 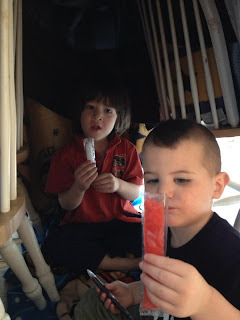 The boys thought it was great (although a little small) and they enjoyed a freezie inside. After the freezie, I decided that the fort needed to be a little bigger, so I could join them inside. This time, we moved into the dining room and used those chairs and tables. We spent about an hour inside playing connect 4 and having fun together! 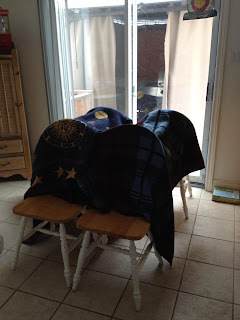 Do your children like to make forts?